6 lacs monthly rental earning property sale 8.5 cr rs near nappalayam 2.4 acres 49000 bld. TNAGAR 1200SQ FEET SPACE RENT SUIT MNC MODERN COMM. BLD.LIFT GEN 1.20 LACS RENT NR G N CHEETY RD. T NAGAR 1800SQ 3 BHK 2ND FL.,CC LIFT GEN 10YR.2.40 CR NEAR THANIKASALAM ROAD. Many mall s and theater nearby . Triplicane is a best residential area. Nearby marina beach and Parthasarathy temple. Prime location. Nearby schools with all the food provisions available. 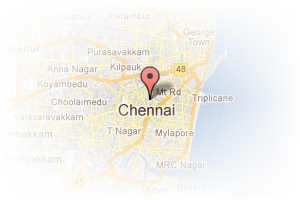 Address: 16 new no, hanumantharayan koil st, Triplicane, Chennai, Tamil Nadu, India. 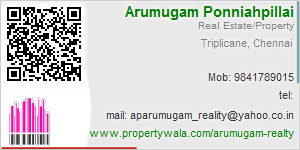 This Broker Profile page for "Padma Realty" has been created by PropertyWala.com. "Padma Realty" is not endorsed by or affiliated with PropertyWala.com. For questions regarding Broker Profiles on PropertyWala.com please contact us.